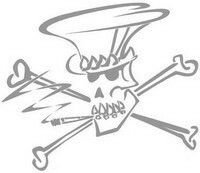 Some nice words from Slash to Slash Paradise: "To @SlashParadise Thanks for everything". Slash & Myles Kennedy playing "Bent To Fly" live acoustic on French TV show C'est A Vous. While he is promoting World On Fire in Australia, Slash performed "Bent To Fly" live in front of more than 80,000 people for the NRL Grand Final game at Anz Stadium in Sydney, Australia. The annual Halloween Horror Nights is underway at Universal Studios Hollywood theme park, and this year Slash has a major role. He composed the original score for the park's new 3D maze called Clowns 3D Music by Slash. Yesterday Slash joined Aeorsmith on stage at DTE Energy Music Theatre in Clarkston to perform "Mama Kin". 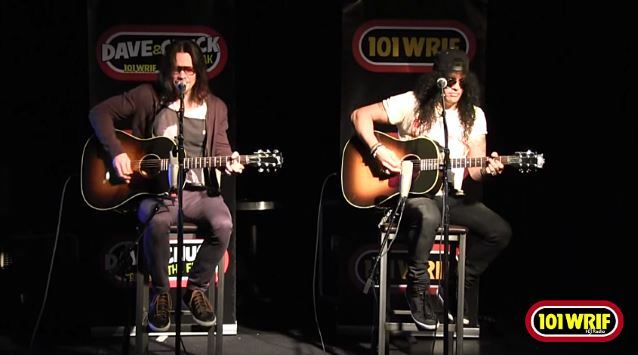 Video footage of Slash and Myles Kennedy performing acoustically for the listeners of Detroit, Michigan's WRIF 101.1 FM radio station. SpongeBob SquarePants, the world's favourite sea-dwelling invertebrate, comes ashore to our world for his most super-heroic adventure yet. Slash & Myles Kennedy performed "Back From Cali", "Bent To Fly" and "Sweet Child O' Mine" for a private acoustic session on 98KUPD radio station. Win the Ultimate Slash Experience with Ernie Ball's "All Access with Slash!". Yesterday Slash and Joan Jett played "Star Star" (The Rolling Stones) live at the Alternative Press Music Awards in Cleveland. Yesterday Slash joined Aeorsmith on stage at Xfinity Center in Mansfield to perform "Mama Kin". The official lyric video for "World On Fire", the title track of the new album from Slash is now online. Slash got a new tattoo in Stockholm, Sweden while he was in town to do press for his new album, World On Fire. 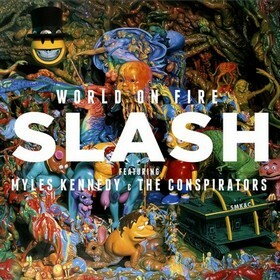 Listen to Slash featuring Myles Kennedy & The Conspirators new single "World On Fire" full version. While promoting World On Fire in Europe, Slash and Myles Kennedy played two acoustic gigs in London (House of Parliament and Spotify headquarter) and performed "Bent To Fly" for the first time on stage. Slash featuring Myles Kennedy & The Conspirators will be touring Europe and the United Kingdom in 2014. All abous Slash's new studio album featuring Myles Kennedy & The Conspirators which will come out in September under the name of World On Fire. Yesderday Slash performed "Mama Kin" and "Train Kept A Rollin'" with Aerosmith at Whisky A Go Go in Los Angeles. Slash recorded a cover of "Wiggle Wiggle", a song he already put on tape with Bob Dylan in 1990, with Aaron Freeman for the tribute album Bob Dylan In The 80s. Yesderday Slash performed "Dream On" and "Walk This Way" with Steven Tyler and Dave Grohl at Howard Stern birthday party in New York. Yesderday Slash performed "Cherry Bomb" and "Black Leather" with Lita Ford and Cherie Currie at Whisky A Go Go's 50th Anniversary concert in Hollywood.